As someone who enjoys spending as much time as possible outside enjoying the sun and nature, I also have to deal with balancing that time against the possibility of getting sunburned. We all know that getting sunburn regularly is a good way to end up with skin cancer, and no one wants that. But, I also hate the idea of only being able to spend 15 minutes or so out in the sun when the weather is great. In the past, I’d go out in long sleeves and long pants so that I wouldn’t get burned. This actually did help prevent that, except for the tops of my hands, which got prime sun exposure thanks to their placement on the bike handlebars. Of course, it also resulted in lots and lots of extra sweating due to all the warm clothes that I was wearing. But this summer, I have managed to find the perfect solution to this problem. So, if you are fair-skinned like me, or just conscious of getting too much sun, then this could work for you too. What I discovered are UV protection sun sleeves and sun gloves. Sun Protection Sleeves and Gloves Are The Best! When I first came across these, I was a little skeptical at how they would be for me. And since I was wearing the long sleeves already, I decided to first give the fingerless sun gloves a try. They’re cheap, so I thought it was really a win-win since there wasn’t a huge cost involved to try them out. They are unisex gloves, which means that both men and women can wear them. And, they are available in a variety of sizes. 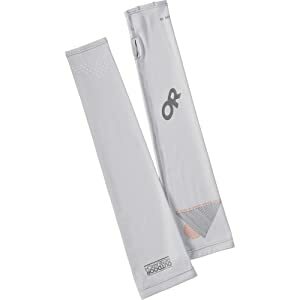 If you browse around, then you will find a few different brands and styles, but these by Outdoor Research are my favorite because they are a light gray color with unobtrusive gripper pads in the palms. And, they don’t draw attention like the other brands I tried out. They are very comfortable to wear and the fabric is moisture wicking, which means that you do not have to worry about getting hot and sweaty hands while wearing them. It only took one day of me wearing these out in sunny weather to determine that they were just that I’d been looking for. 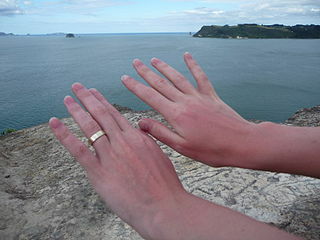 In fact, this was the first time that the backs of my hands didn’t get lobster red from a summer day of riding. That was all it took for me to try out the matching sun sleeves. As you can see in the image to the right, the UV protection sleeves by Outdoor Research are an identical match to the fingerless sun protection gloves above. I purchased this particular set of sleeves not because it matched the gloves, but because the color goes with pretty much all of my jerseys. And, the price is about the same as for gloves. But, there are some other brands out there that offer different color choices. 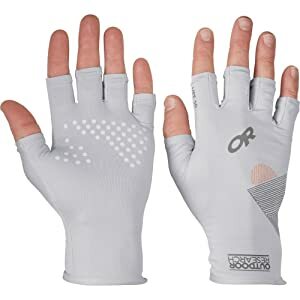 I learned that these UV sun protection sleeves are very popular with golfers (who don’t need the matching gloves since they wear golf gloves). So, that is why you can find more color variety in the sleeves. A good option for color sun sleeves are the Eclipse Sun Sleeves for golfers. With them, you can choose from over 10 different color and design options – including stripes, polka dots and zebra print. So, they have a little something for every one. Or, stick with the Outdoor Research gray ones like me and know that they’ll go with all your cycle jerseys and hiking shirts. Overall, what I really like about these sun sleeves and sung gloves is that they work as advertised and can be used for pretty much anything that you do outside. So far, I have used mine for hiking, biking, running and playing tennis. It’s nice to be able to spend a lot of time out in the sun and not have to worry about getting burned. Plus, it saves me from having to buy all that aloe vera that I used to have to get for my sunburns!